Neuropathy is a dysfunction of nerves leading to loss of sensation. Although many people develop neuropathy, a limited number of those people go on to experience pain associated with their symptoms. 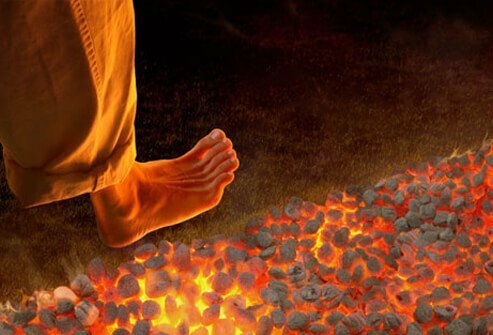 This condition is known as painful neuropathy, and the pain is described as neuropathic pain. The specific reason that pain develops with neuropathy isn't known. Several theories have been proposed. One theory suggests that when nerve cells are unable to conduct sensory impulses or messages, spontaneous activity begins within the nerve cells that the brain interprets as pain. Unlike pain that occurs in response to an injury, neuropathic pain occurs without any associated stimulation. At times, neuropathic pain may be associated with an exaggerated or heightened sensitivity to normal stimulation (such as a light touch or the sensation of clothing) and these sensations may be misinterpreted as pain. Pain is unique to everyone. As such, the words used to describe neuropathic pain may vary. Frequent descriptions include pricking, tingling, burning, stabbing, or aching. The pain may be present on a constant basis, or it can wax and wane in intensity. As described, the pain is most often present without associated stimulation, but actions such as bearing weight may dramatically exacerbate or worsen the pain. There are multiple causes of neuropathy, ranging from diabetes mellitus (the most common cause of neuropathy in the U.S.) to exposure to toxins. Many illnesses -- not just diabetes -- may be associated with development of neuropathy, including HIV and kidney failure. Injury to a peripheral nerve can lead to neuropathy. Alcohol and tobacco can lead to neuropathy and some prescription drugs have been shown to cause neuropathy. Shingles (herpes zoster) can lead to pain in the nerve fibers which were affected by the rash. Once neuropathy has developed, pain may begin at any point. At this time, doctors aren't able to predict who will develop neuropathic pain. In fact, many people are unaware of the presence of neuropathy until pain begins. People can decrease their risk of developing neuropathy by limiting their exposure to alcohol, tobacco, and environmental toxins, as well as maintaining good general health. Chronic pain is the most common complaint of patients with neuropathic pain. Although many people experience pain in their feet, legs and upper extremities can also be involved. There is no obvious cause for the pain and often the pain has been present for many weeks to months before patients will seek evaluation. The quality of pain may be unique for every person; burning, stabbing, prickling, or tingling are words commonly used to describe the symptoms that people are experiencing. Because the entire hands and feet are commonly affected, the symptoms are often described as being in a "stocking-glove distribution." No objective test for pain has been developed. As such, when patients present with complaints of neuropathic pain, testing for evidence or causes of neuropathy is performed. Physical examination may reveal decreased ability of a patient to sense temperature or light pinpricks. Strength and reflexes are usually normal. Patients may be unable to identify if someone is moving their foot or toe and may be unable to sense a vibrating tuning fork. If there is evidence of neuropathy on a physical examination, a nerve conduction study with electromyography (NCS and EMG) may be ordered. This test is used to determine the severity of the neuropathy, and may offer additional clues as to the cause of the neuropathy. Blood tests can be used to identify vitamin deficiencies or other metabolic abnormality which is contributing or causing the neuropathy. In some cases, MRI or CT scans may be needed to further define possible causes of the neuropathy. Skin or nerve biopsies are done infrequently but can provide further information in some situations, such as small fiber neuropathy. Once the neuropathy is defined, further evaluation of the discomfort that the patient is experiencing may be done. 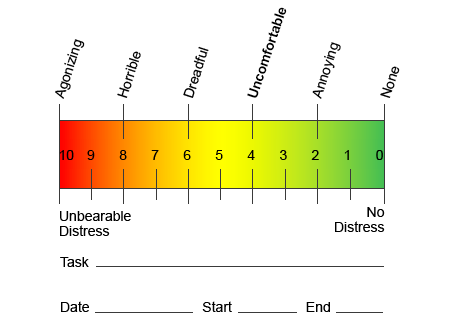 Visual analog scales (VAS) are often used to gauge the severity of the pain that patients are experiencing. Visual analog scale (VAS) for pain chart. Treatment of the underlying cause when possible is key. Many different medications can be used to treat neuropathic pain. However, it should be noted that no specific medication has been approved to treat all types of painful neuropathy. Recently, selective serotonin reuptake inhibitors or SSRIs (for example, paroxetine [Paxil], citalopram [Celexa]), and other antidepressants such as venlafaxine (Effexor) and bupropion (Wellbutrin) have been used in some patients. Antiseizure medications carbamazepine (Tegretol), phenytoin (Dilantin), gabapentin (Neurontin), lamotrigine (Lamictal), and others have been used for many years. In severe cases of painful neuropathy, medications typically used to treat heart arrhythmias may be of some benefit. Topical agents (lidocaine or capsaicin) have been used as well. The use of opioids to treat chronic pain is a frequent topic of debate and this argument will not be repeated here. Opioids may have a place in treating some cases of neuropathic pain. Curing neuropathic pain is dependent on the underlying cause. If the cause is reversible, then the peripheral nerves may regenerate and pain will abate; however, this reduction of pain may take many months to years. Patients with chronic nerve pain may suffer from sleep deprivation or mood disorders, including depression and anxiety. Because of the underlying neuropathy and lack of sensory feedback, patients are at risk of developing injury or infection or unknowingly causing an escalation of an existing injury. The best way to prevent neuropathic pain is to avoid development of neuropathy, if possible. This includes identifying and modifying risk factors for diabetes, avoiding exposure to environmental toxins when possible, and limiting use of alcohol or tobacco. Utilizing good ergonomic form at work or when practicing hobbies can decrease the risk of repetitive stress injury. Marchettini, P., et al. "Painful peripheral neuropathy." Current Neuropharmacology 4.3 (2006): 175-181. Mendell, J. and Z. Sahenk. "Clinical practice. Painful sensory neuropathy." The New England Journal of Medicine 348.13 (2003): 1243-1255. O'Connor, A. and R. Dworkin. "Treatment of neuropathic pain: an overview of recent guidelines." The American Journal of Medicine 122.10 Suppl (2009): S22-S32. What is or was the cause of your neuropathic pain? How would you describe the pain you get from neuropathic pain? What treatments have been effective in treating neuropathic pain?